I encourage you to vote for Larry D. Kump to serve in the West Virginia House of Delegates. I've known Larry for many years and know him to be a man who, above all else, carries the courage of his convictions. In his previous years of public service (1978-1989) in Indiana, he was a credible and effective voice with the Indiana Legislature. He never was afraid to tackle difficult problems. In today's political environment, it's always easier to do the popular thing. That's why it's so refreshing to have someone like Larry, who will provide leadership grounded in core beliefs. He's not another political "follower", who makes decisions based on current political winds. As an Indiana resident, why do I even care about an election in West Virginia? I truly believe that our country is facing a period no less daunting than previously faced by Abraham Lincoln, and I pray that our country now is waking up. We need LEADERS, not only at the Federal level, but in all fifty states. This will require a tremendous amount of courage of principle. We can do this together, one leader at a time. May God bless Larry and all of you. Please vote for Larry D. Kump on election day. Regardless of where you live, your individual campaign contribution will help further the cause of increasing jobs and prosperity, enhancing personal liberty and family values, and returning government back to the people. West Virginians already pay more gasoline taxes than do our friends and neighbors in surrounding states, even though our highways reflect little good effect from this tax burden. Many of us here in the Eastern Panhandle cope with this highway robbery by fleeing across the border to Maryland and Virginia to fill up our gas tanks. But now, in addition to pushing for even more taxes via toll roads, our West Virginia Bureaucrats in Charleston are clamoring for an even bigger bite out of our already empty pockets by pushing for an additional five percent (5%) surtax on all of us for patronizing fast food drive-ins. These highwaymen all must be riding Jesse James' horse. For more of this about that, visit The State Journal editorial "DOH Gone Wild: Cheeseburger Tax" (September 17th, 2010). An edited version of the above also appeared as a letter to the editor in the September 28, 2010 edition of the Hagerstown Herald-Mail newspaper. In the 13 years I've known Larry D. Kump, I've always known him to champion the oppressed, the disempowered, and the voiceless. He fought for the rights of those who couldn't fight for themselves. I was one of those, coming to this country as an Asian immigrant. He fought for me several times. He is like that with people who need his help. Larry understands the plight of ordinary people, working people, single parents, family men and women, the older generation and the young ones, the disenfranchised, and also the well to do. He is that versatile, but has remained unaffected by fame, fortune, and misfortune. He simply is a genuine and sincere human being. West Virginians have a "True Champion" in Larry. Hello, everyone. This is a real person, speaking from her heart. I mean it. Larry has a heart of gold, but he also is a formidable opponent against injustice(s) and unfairness. Vote for him to serve in the West Virginia House of Delegates and you won't regret it!!! I promise you that. 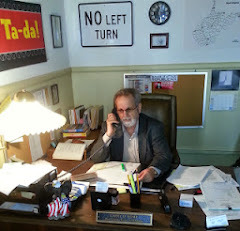 It is fantastic news that Larry D. Kump is running as a candidate for re-election to the West Virginia Legislature. I've been a friend and colleague of Larry for over twenty years. For many of those years we served together in our union for professional employees. Larry was an untiring advocate for Maryland's state employees, and I am sure that he will put his advocacy skills to good use as a representative of his West Virginia House of Delegates District #52. 1. Larry is unselfish and honest. 2. Larry is all about helping others. 3. Larry will put his constituents' interests ahead of the special interest lobbying groups. 4. Larry is a fiscal conservative, lives prudently in his private life, and takes those skills and attitudes with him when he goes to serve others in the Legislature. 5. Larry believes in less government interference in our lives. 6. Larry recognizes that government has become increasingly bloated and expensive. 7. Larry believes that we are over taxed, and he makes every effort to reduce taxes on already cash strapped West Virginians. "Friends of Larry D. Kump"
Please also pass this along to your friends, family, and other associates and ask them to go and do likewise.